The Land Unknown (1957) was based on fact? The Land Unknown (1957) is a Universal picture about explorers finding a prehistoric jungle in icy Antarctica, which should clue you in to how bad this movie is. Taking a page from Toho studios, Universal used rubber dinosaur suits, cheap special effects, and puppets for this movie. It still cost too much, so to save money, they shot it in black and white instead of color. I guess we shouldn’t expect too much from these guys. The first prehistoric modern-day story I know of is The Lost World (1912) , a novel written by Sir Arthur Conan Doyle, the creator of Sherlock Holmes. 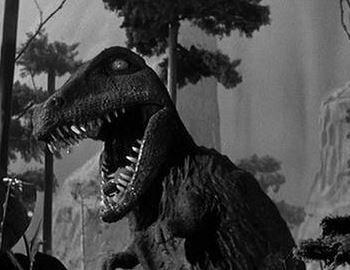 In that story, a hidden land of dinosaurs is found in South America, unlike The Land Unknown (1957), which tries to tell us that dinosaurs are hiding in a crater below sea level on Antarctica, which stretches the facts. The Lost World borders on parody, but Conan Doyle knew the story was way out there, unbelievable, and not very realistic. He explained that we shouldn’t dismiss it though, but embrace it as a fun adventure. In fact, one of the characters questions if the dinosaurs were real, as if saying what the audience is thinking. The structure of the Lost World also helps the reader get into the story. The Land Unknown does not have this same courtesy for the viewer. It begins with an exposition and never disarms the viewer with a thematic conceit like The Lost World does. Conan Doyle’s story is surperior to The Land Unknown in this and many, many other ways. None of the characters in The Land Unknown side with the audience, as the characters do in The Lost World. The people in The Land Unknown are not there to question anything, but are simply thrown into a lost land to experience dinosaurs and give us some quick thrills. It doesn’t work. There is very little setup in this movie, but there is some scientific discussion preceding the mission, based on actual fact. A stuffy scientist explains that there is a “warm region” on Antarctica, first discovered by the army. They don’t spend much time on that though, because the scientist is not going on the science expedition. The exploration group is composed of a reporter and some military guys, for some reason. They basically stall until it is time to explore and find some dinosaurs. This movie was inspired by the legitimate expedition led by Admiral Byrd to Antarctica in 1946-1947 and in 1956. Byrd discovered ice free lakes and over 300,000 square miles of warm areas. This is a real area, photographed and studied by scientists, but it doesn’t have any craters or secret underground areas with dinosaurs. It’s just a bunch of hills that are slightly warmer than the rest of the icy cold continent. This expedition is clouded in myth because of rumors about “strangeness” in Antarctica’s “warm area”. Most of what happens in the movie is based on this strangeness, but it largely makes no sense. For example, a “storm” comes up out of nowhere and proves that the army doesn’t have weather radar. The helicopter doesn’t work until it has to work. 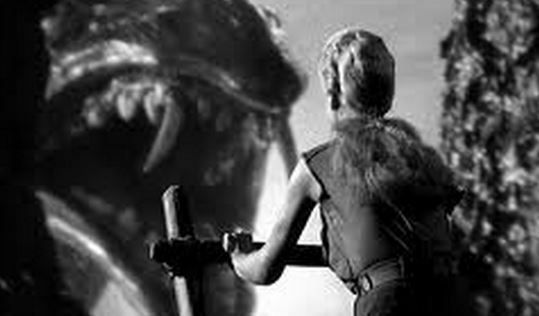 The army men oogle a woman like dogs, then try to sacrifice her when dinosaurs attack. One of them remembers that he is a human being and doesn’t go through it. The effects are bad, but the acting is worse. Shirley Patterson plays Maggie and has some of the worst lines of dialogue I’ve ever heard. She is the reporter assigned to the mission. When told she was going to be alone with dozens of men, she replies, “Well I do love meeting men”. Huh? The last movie in her career was IT! The Terror From Beyond Space (1958), then she left acting. This movie was made for a quick buck and it shows. Most of the adventure into the “land unknown” is masked in fog, perhaps deliberately to hide the bad effects. 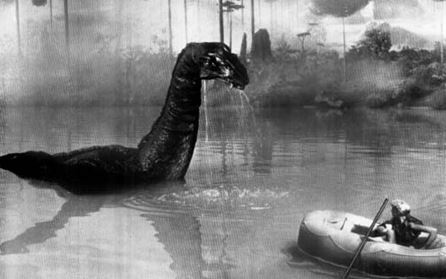 The river monster isn’t too bad I guess, but the rubber dinosaur needs a lot of work. The head is good, but the body is terrible and moves awkwardly. The matte paintings are pretty decent though and the scenery is well-done. Lizards are used to stand in for dinosaurs at one point because of the high cost of rubber suits. They just zoom in and make the lizards appear as large as a dinosaur. 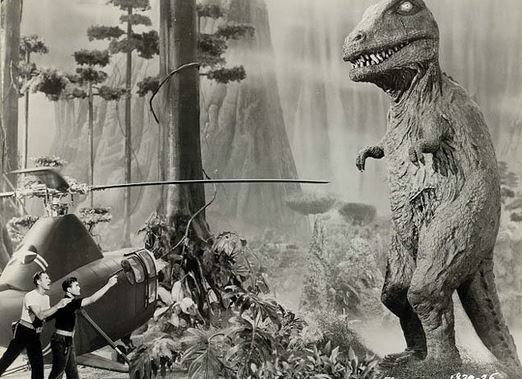 They shuffle the T-Rex around and super-impose the actors in front of monsters on a screen. At least the T-Rex rubber suit has blinking eyes though, which is more than I can say for many Godzilla movies. All in all, this movie is pretty dated. It doesn’t touch on the historical account of Admiral Byrd at all, so if you’re looking to explore the mystery of his discoveries, this movie is not where to look. That’s a big disappointment, in my opinion. They have a ready-made mystery and do nothing with it. Admiral Byrd returned to Antarctica in the 50s and continued to fuel the fire of unusual discoveries there, but I guess I’d rather read The Lost World. I could say the same of this movie. ← What if The Plumber (1979) invaded your house and scared your wife?